Chic and spacious, classic French living; an hour from five budget airports! Best of everything - chic getaway in charming French village, mins from Med! Welcome to L'Oasis in Lespignan! This house has to be seen to be believed. 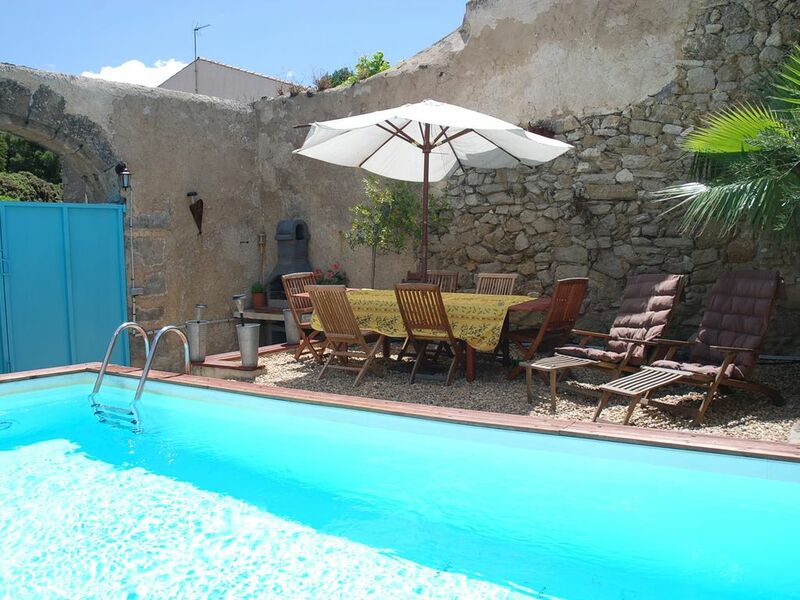 It sleeps up to 9 adults in four bedrooms (+ one foldaway bed and baby cot), and is in the heart of lovely, traditional Languedoc village, 100m from restaurants and shops, just 10 minutes from closest beach. Peaceful but near the action. Just 15 mins from Beziers Airport (new Ryanair route!) and others Ryanair airports Montpellier, Carcassonne, and Perpignan. Minutes fro main autoroute. Before the highly original conversion, local winemakers deposited their grapes and stored wine here. One of the wine vats ('cuves') has been opened to make a large and spacious bathroom. The courtyard hosts a Mediterranean garden with private swimming pool, aBBQ and dining area. The interior is fascinating. On three levels, original beams and stone sinks lie in situ with bleached and stained floorboards, paint-washed walls in Mediterranean colours, further flagstone and terracotta floors with glass-blocks in both walls and ceiling. Free wifi. Great for groups! L'Oasis: An oasis of calm : L'Oasis is a self-catering haven of calm, boasting rustic French Provencial charm, airy spaces and high wooden rafters. Its stone design keeps it remarkably cool in summer, especially in the lower bedrooms. It sleeps ten adults in four bedrooms, with regular beds for nine and one foldaway bed, which can be put in any bedroom. There is also a baby cot. Amazing open-beam design, with a wide open-plan lounge opening up to cosy, romantic private pool and courtyard. In the heart of a lively French village, just 10 mins from white sand beaches. Three Ryanair airports within one hour. Great place for family vacation, or for a reunion with friends! Courtyard and top level: Private, off-road parking in driveway. Private courtyard with swimming pool and solar cover, wooden deck, BBQ and seating area with large table, chairs, and two wooden sunloungers. Mediterranean plants. Safety barrier (complying with govt regulations) for pool. Entrance through courtyard. Coffee nook, sunny sitting area with mosaic table and cushioned seating with view to pool. Above, large open-plan living / dining room with painted floorboards and illuminated glass panels, original beams. Big table seating 8-10. Lounge/library area with sofa/armchairs, TV with UK satellite. DVD player with MP3. Wood-burning stove, which can be closed or opened up as cosy fireplace. Door to 'Coup de Coeur' alcove, airy, lavender-tinted bedroom with open beams, white-washed floors, double bed and table. Small bathroom with rustic wooden decor. Tub/shower and sink. Kitchen overlooking pool with dishwasher, hob, gas stove, microwave, fridge/freezer, Provencial buffet, wooden worktops. Senseo coffeemaker. Lower level, bedrooms and main bathroom: Lower level, where most bedrooms are, has separate entrance from exterior (road level). Other (courtyard) entrance is accessible by ramp... courtyard rough gravel but wheelchair accessible. Stairwell a bit steep, but carpeted and with safety rail on one side, and decoratively gated on other. Baby gate at top of stairs. Ocean Breeze room: One bunk bed (sleeping two) and an extra single. This room sleeps three comfortably. Bathroom: Large white French Provencial bathroom with large bath, two sinks, and water closet in separated area. Washer and tumble dryer. toilet, combination tub/shower, Two sinks, toilet in parially closed off room. toilet, combination tub/shower, Small shower attachment in bath. Pool size is 5.5m long, 3.5m wide, with a maximum depth of 1.3m. There is no shallow end, Elderly guests welcome, though stairs are a bit steep, and with railing on one side. Many safety features have been added for children (two baby gates, plus barrier around pool but care should be used around steep stairwell. Right from the initial point of contact Jennifer couldn't be more helpful. When we arrived there was a lovely welcome gift and a bottle of wine. Everywhere was clean and tidy and just lovely. The rooms are all a good size and the pool is just a God send on hot sunny days. There were 8 of us and we had plenty of space. The kitchen had everything we needed, the oven is a bit fierce so would suggest cooking everything at a lower temperature. We stayed for 2 weeks and Jennifer was the other end of the phone if we needed anything. I personally can't recommend this place enough and would love to go back again, well to be honest we didn't want to leave. Thank you for letting us borrow your home and for everything along the way. When we arrived at the property the owner was there to greet us and give us a guided tour. She was friendly and helpful and was able to answer all our questions. The property itself met our expectations in terms of facilities. It is an unusual property, very rustic and full of character. The courtyard garden was lovely and our children spent hours in the little swimming pool. We enjoyed using the BBQ and there was plenty of room for all nine of us to sit and eat outside. There were a few minor issues which need to be sorted out: the kettle leaked, there was a hole on the staircase which needs fixing, fridge did not seem 100% efficient, the dishwasher was a bit temperamental and there were no hangers in the wardrobes. However this did not detract from our overall enjoyment and we would definitely rent this property again. The village of Lespignan is quiet and feels quite off the beaten track which we liked. There is a bakery, greengrocers, butchers, a Spar, a pizza shop and three restaurants within a few minutes walk. There is also a good supermarket and Mc Donalds 10 mins drive away. There were lots of lovely beaches and plenty of places of interest to visit within an hours drive including the beautiful Canal du Midi, Carcassonne and Montpellier . Everything I wanted and more! The listing was as advertised. It's rustic charm gives the feeling of more than a place for a holiday; a feeling of coming home. Sunny days under a palm tree by a lovely clean pool and an easy to operate barbecue. The owner was charming and even purchased extra outdoor chairs when we said there would be guests for a barbecue. She is certainly someone willing to go the extra distance for her guests. The open plan kitchen/dining area is very convenient. With comfortable bedrooms on both floors there is plenty of privacy. The rustic feeling gives an idea of what the village might have been like a century ago, but with modern conveniences. It was altogether the happiest of times and I look forward to a return stay. Our party of 6 stayed in May 2016 and we LOVED it. The villa is the perfect base from which to explore the area or for a relaxing break. It is full of character and wonderful features. Outside has a great area to make the most of the climate: to sit in the sun, dine, BBQ and has a lovely sized pool. Indoors has lots of space and is very well equipped. Actually, if anything we would say that the pictures do not do it justice - it is best to see with your own eyes! In addition to the property, the owner was absolutely lovely. She was so helpful and knowledgeable, we really thank her for allowing us to stay in her home. Thank you Jennifer! Highly recommend. This is a very nice house for up to 10 persons. We were there for two weeks with our kids (14 and 16 years old) and several adult nieces and nephews. We came by car from Germany, but others used the airports in Toulouse (2 hours) and Béziers (with a flight for 23 € to Dusseldorf!) or the trainstation in Béziers (20 minutes) or Narbonne (30 minutes). The rooms were fine (bring warm pyjamas in the end of may for the downstairs rooms!). The upper bathroom is very small but fine for the two people sleeping upstairs. Only two WC´s for ten persons can cause a "traffic jam". The kitchen was well equipped with really everything you need. Maybe it would be helpful to know that the "coffee machine" is for Senseo pads (I brought plenty of coffee powder for filter coffee which is mostly used in Germany). The living room has plenty of space and a huge table for everyone. The pool has an adaequate size even for many youngsters playing in it (I am afraid the neighbours didn´t have as much fun as the kids in the pool...). Everything was clean and well-maintained. The only minus is the small outdoor area beside the pool with only two sunbed chairs and no place for any other outdoor activity except reading, sitting and talking. In the first week it was very windy and the parasol couldn´t be used when the wind was too strong. But in the second week with perfect sun and warmth there was always a bit of shade and a bit of sun for everyone who liked one or the other (very nice to have breakfast on a sunny table in the early morning). For food you have the Spar close by and within 10 km Lidl and big French Supermarkets (where you get cheap fuel!). And a very nice boulangerie in walking distance. We made nice trips to Carcassonne, the Kathare castles Quéribus and Peyrepertuse, Narbonne, Béziers, Montpellier, Saint-Guilhem-le-Désert, Abbaye de Fontfroide and Sete. Dining in France is expensive, but we recommend an evening in Sete, where you can dine along the canal for 15 € for 3 courses - try the seafood, snails and frog´s legs!). Menus at noon are often cheaper. Altogether it was a wonderful holiday in Languedoc! The owner Jennifer awnsers e-mails really quickly and helps with any information you need - and she is really generous! I can recommend her house warmly to larger groups! We rented L'Oasis for a late summer early autumn break and the weather was perfect for enjoying this part of France, namely the vineyards. The house was airy and had plenty of room for kids to run around. We particularly enjoyed the bar b q and pool area, it was very cosy. Jennifer was extremely helpful and attentive to all our questions and requests, she is a mine of information and really made a difference to our stay. Easily accessible to two local seaside villages and beaches. 10 minutes' drive to lively Valras Plage, 15 minutes to quieter Serignan Plage, 25 mins to Narbonne Plage. Great beaches also at Fleury. All with great seaside restaurants. Beziers train station 6.6 miles, Narbonne train station, 12 miles. Beziers city centre, 6 miles. Montpellier city centre, 49 miles. Perpignan city centre, 52 miles. Standard booking deposits and cancellation policy. Full terms and conditions available on request (stricter during high season). Normally 25% taken on booking, the balance due eight weeks before the start of the holiday. Linen charges are £10 (12 euros) per person. £200 security deposit taken with payment, returned within 15 business days. Flexible change dates out of high season.